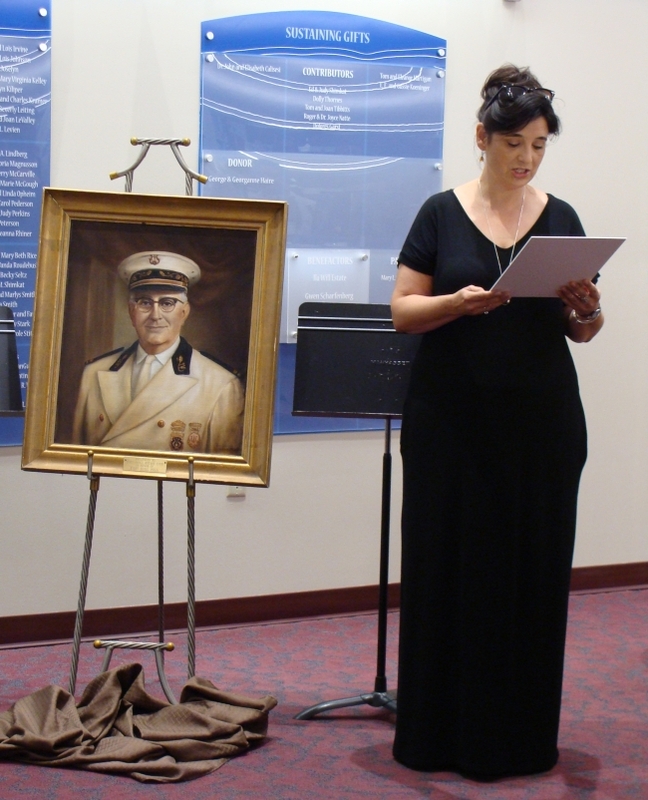 The Karl King Archives held an unveiling of the recently professionally restored Karl King portraits on June 19, 2018. 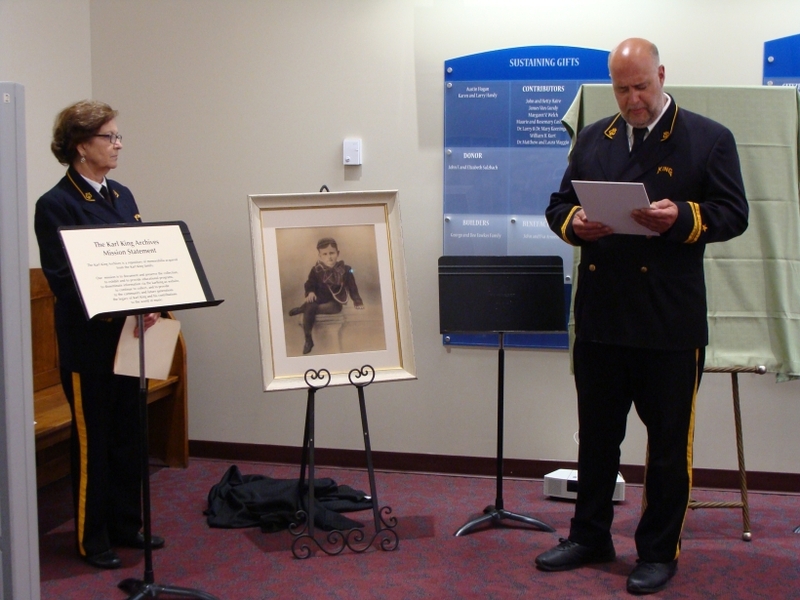 The public was invited to attend a presentatiton held at the Fort Dodge Public Libraryat 1:15 that day. 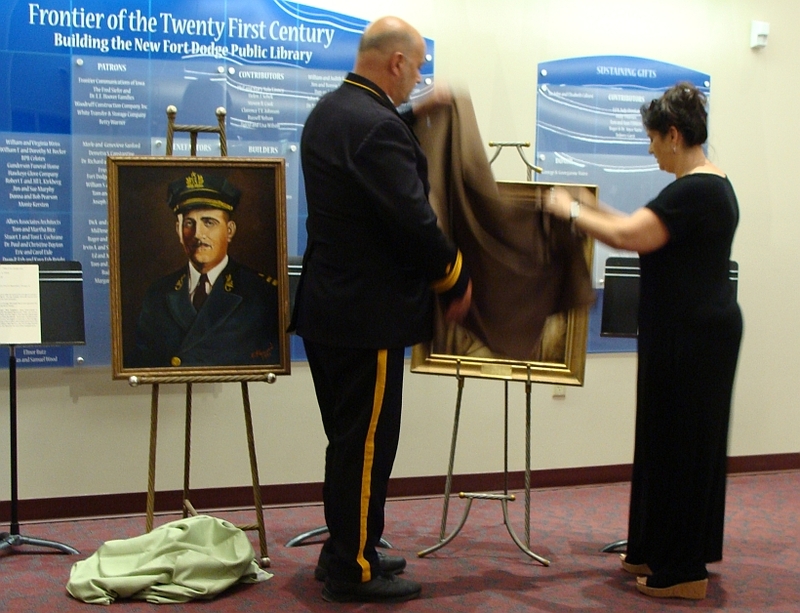 The restoration of the four portraits embellishes the current archives and preserves for future generations the legacy of Karl King and his contributions to the world of music. 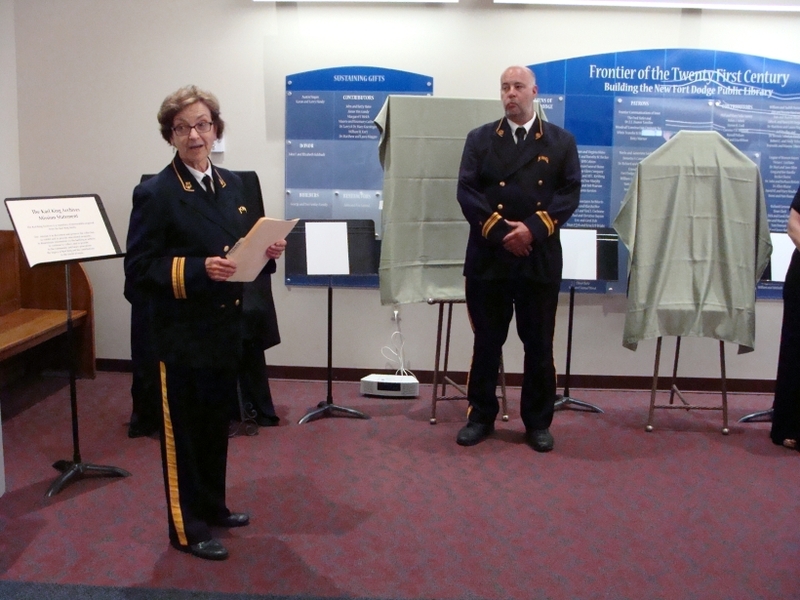 Archivist Nancy Olson reads the mission statement of the Karl King Archives. 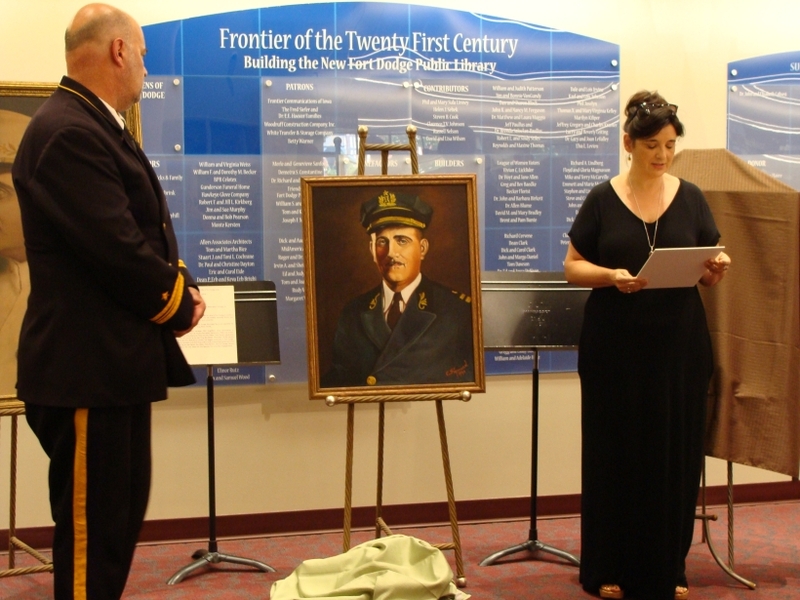 Paul Hochmuth, member of the of the Karl King Band, tells about the first image unveiled. Karl Lawrence King was born February 21, 1891, in Paintersville, Ohio. King completed an eighth grade education in Canton, Ohio. He worked for the Canton Repository newspaper and he mastered the baritone horn, both playing in and composing for bands. At age 19 he joined the circus as a musician traveling all across the United States and part of Canada. Mr. King became bandmaster for the Sells-Floto/Buffalo Bill's Wild West Show and the world famous Barnum & Bailey Greatest Show on Earth. 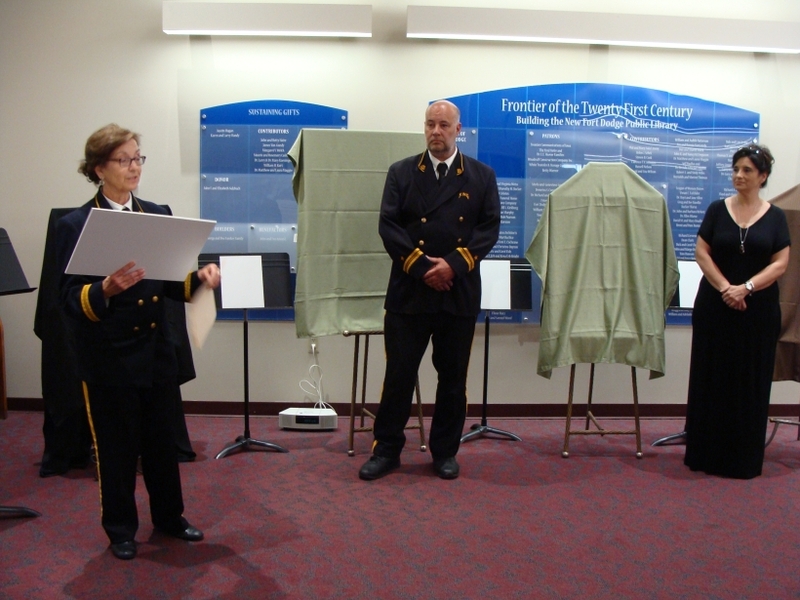 The Second image is unveiled and explained by Paul Hochmuth. This is a portrait of Karl King soon after he came to Fort Dodge to conduct the Fort Dodge Municipal Band. He was already nationally known and respected as a circus conductor and composer. Karl King conducted the Fort Dodge Municipal Band and operated his publishing business, K.L. King Music House. Mr. King and band manager, Walt Engelbart, were instrumental in advocating for the City Square Bandshell (dedication 1930, now known as the Karl King Memorial Park) and the Oleson Park Pavilion (dedicated 1938, now known as the Karl King Bandshell). More than 14,000 people attended this dedicatory concert, the largest crowd ever in Fort Dodge. Band members wore their King uniform with pride as the performed in the City Square Bandshell, the Oleson Park Pavilion, the Fort Dodge Harvest Festival, the Iowa State Fair, the Spencer Fair and other engagements. Susan Garro shows and explains the third picture. Barry Bauman is the conservator of this original painting. 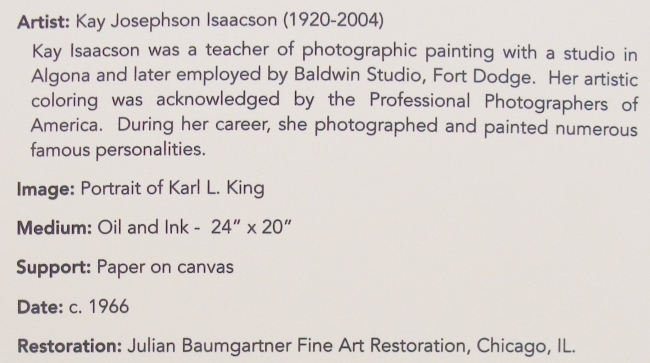 Mr. Bauman worked at the Art Institute of Chicago for 12 years. He then founded the Conservation Center for Fine Art which grew to become the largest private facility in the United States. 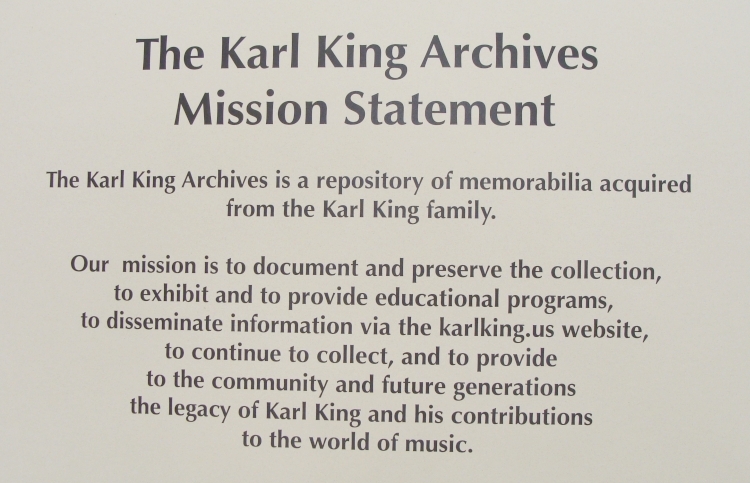 Mr. Auman was the advisor for the Karl King Archives. As a composer, King was one of the most prolific and popular in the history of band music. It was in the 1920s that the beginning band movement began in Iowa schools. Karl King composed an array of musical styles such as overtures, waltzes, galops and marches for school and professional bands. Throughout the Unites States, Mr. King adjudicated at music competitions and as guest clinician and conductor at music festivals. His music continues to be performed worldwide by bands of all experience levels. The fourth and final restored image is uncovered. Susan provides the background details of the final image. During this era, Karl King conducted nationally televised appearances at university band day extravaganzas. The University of Houston Band Days had 7,479 musicians playing together on the football field at half time. The University of Michigan Band Days found 13,252 musicians playing under his baton, believed to be a world record. In 1962, King and his band appeared dutifully at the dedication of the new two million dollar viaduct spanning the Des Moines River. When the plaque was unveiled, it bore the name of Karl L. King Viaduct, a well-kept secret until that moment. 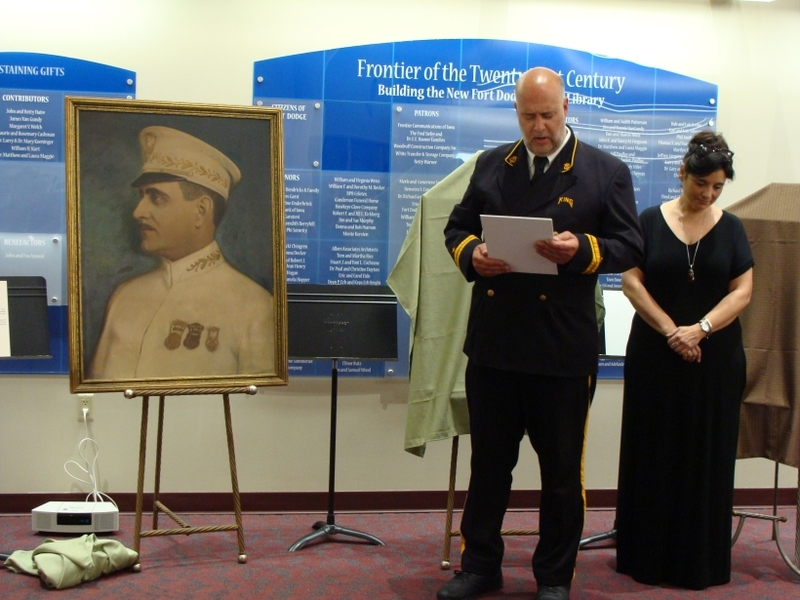 Within his lifetime, King received the highest honors and awards of his profession. The American School Bandmaster's Association gave their most coveted award - The Goldman Award - to Karl King at his last concert, February of 1971. The award is for "outstanding contributions to the advancement of school bands". This organization had to waive one of their stipulations in order to award an individual outside of the field of music education. 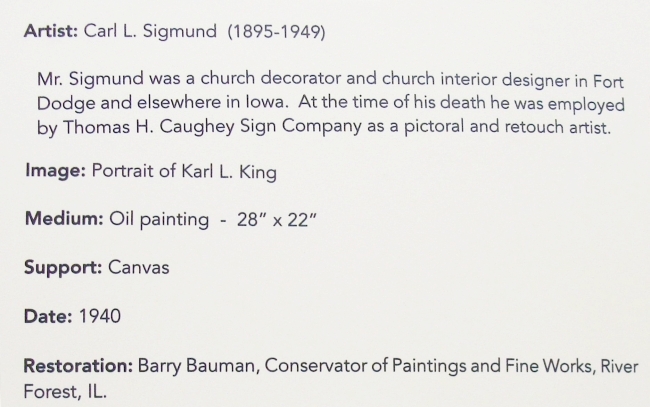 Karl King loved Fort Dodge. Right here in Fort Dodge, Iowa lived a famous man who continues to touch the lives of each of us through his live and his music.